Judy Garland stars in Vincente Minnelli's classic musical following the middle-class Smith family in the lead up to the 1904 World's Fair hosted in St Louis. Esther (Garland), the second eldest daughter of Alonzo (Leon Ames) and Anna Smith (Mary Astor), falls for her new next door neighbour, John Truitt (Tom Drake), and initially has difficulty winning his affections. When their romance begins to blossom, however, Esther learns that Alonzo's employer is transferring him to New York where he plans to move the family. It soon becomes clear how much the move will affect his four daughters and son, Lon Jr. (Hank Daniels), and, what's more, it means they will miss the World's Fair. 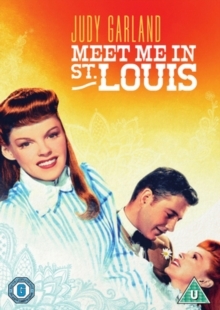 The film includes the songs 'Meet Me in St. Louis', 'Have Yourself a Merry Little Christmas' and 'The Trolley Song'.